M’s Machine & Mfg. Co., Inc. - Monona Chamber & Economic Development, Inc.
A woman-owned business since 1982, M’s Machine & Mfg. is ISO 9001 certified and currently operates out of two facilities with a total of 27,000 square feet, currently employing a total of 27 employees. With over 100 years combined experience, M’s Machine’s employees are encouraged to make suggestions to increase efficiency and improve our performance. Driven by our Quality Program, everyone from the president on down to each employee is committed to delivering on-time, defect-free products to our customers. At M’s Machine, we invest in the highest quality machinery and the best employees to assure top quality products to our customers. With over 20 highly-automated CNC machines, we are a highly-automated northeast Iowa operation, and we keep our equipment up to date by continuously investing in new technology. Our state-of-the-art machining technology, precision and prototype, and our milling, drilling, tapping, and turning capabilities allow us to be your one-stop source for all your machining needs. Please visit our slide show below to see some of our staff and operations as we celebrate over four decades as a woman-owned business and major employer in the Monona area and in northeast Iowa. ​There may be employment openings from time to time, and we encourage interested potential candidates to contact us to complete an employment application. The public, city and chamber leaders, school teachers, and students were cordially invited to attend M's Machine & Mfg. Co.'s "MFG Day" in October, 2016. We were so pleased with the attendance, interest in understanding what we do and touring our facility, and the outpouring of support for our women-owned manufacturing contributions and jobs created in the Monona community. Thank you to all, and we're looking forward to 2017 MFG Day! M's is our March, 2017 "Small Business Spotlight of the Month" -- an industry Monona is proud to have and a top-notch employer for our area! M's Machines & Mfg. Co., Inc.'s "2015 Manufacturing Day" event. They'll highlight how important manufacturing is to the U. S. economy & showcase their rewarding, highly-skilled career jobs available. You'll learn the skills to pursue to lead to a long-term career that offers security & growth for qualified candidates in this sleek, modern, technology-driven industry. 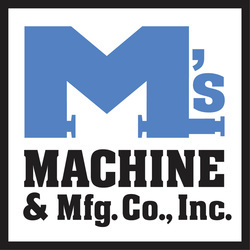 ​Taking pride in its rewarding & quality work, on-time delivery, long-term & loyal employees, high work ethic, & good working conditions, M's Machines & Mfg. Co., Inc. hopes you'll visit them "at your convenience" on ​Oct. 2 between 3 & 6 p.m.